I recently came across this historic print of Public Square in the American Memory collection at the Library of Congress. The hand-colored print, from 1873, shows a view of this piece of downtown Cleveland that few would recognize. The only building still standing today is the Old Stone Church, seen to the left. 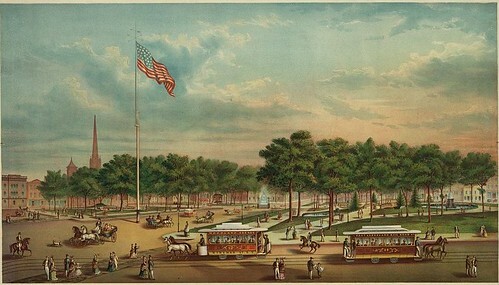 There are plenty of historic photographs and drawings of Public Square. Most of them either show the early history of the city, from the 1830s and 1840s, or are later and show the space encased by buildings. This space has been part of the layout of the city, since the original design. As new plans for the square are discussed, it seemed a good time to bring up this bit of history. The downtown area is sorely lacking in parkland. Perhaps this greener version of the square is worth reconsidering.